I have been so blessed to have so many different opportunities to photograph weddings here and abroad, but photographing a wedding on a boat, is very special. My clients gave me this amazing once in a lifetime opportunity to have their wedding photograph on the Charleston Harbor Tours & Cruises. We cruised around Charleston viewing it from the water, the South Carolina aquarium, the battery with amazing historical homes, and this day was just beautiful, the sky above with the perfect blue color with the perfect clouds, as white as they could be, then the ceremony began, with the background of our amazing Ravenel bridge, guest and family looked on and I am always as unobtrusive as I can be, but I had to capture this image from this angle as I moved around, I pulled out one of my many cameras with different lenses, one of the beauty of being a wedding photographer, is that I carry 3 cameras at all times with various lenses, I had a fisheye and got it as close to one of the bridesmaid to give the image, from my perspective by including them being on that boat of the Charleston Harbor Tours & Cruises, and having that background that clearly breathes Charleston, Sc. I love this final wedding image, it is definitely a unique and different wedding image. It is me, it is what I create, amazing wedding images for my clients. 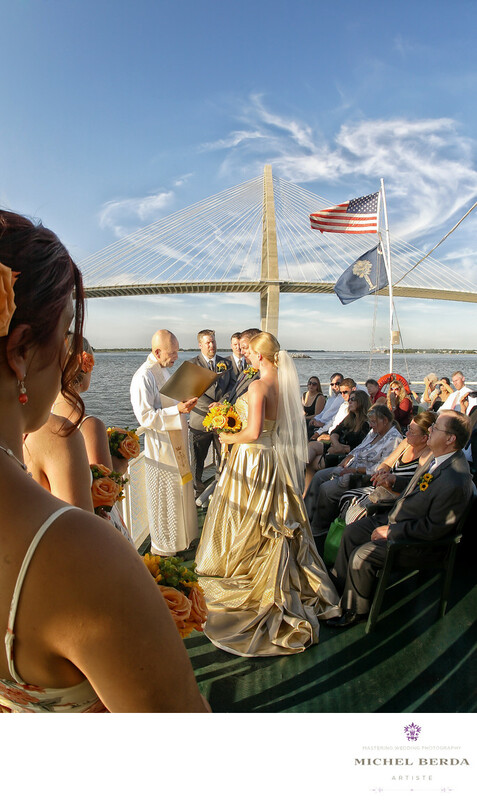 Keywords: Charleston Harbor Boat Wedding (3).